Shows the life cycle of a typical Jellyfish, including the Australian Spotted Jellyfish. 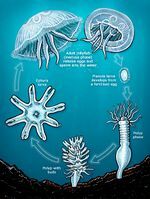 The basic cnidarian reproduction cycle can be divided broadly into two parts. It involves an asexually reproducing polyp stage, alternating with a sexually reproducing medusoid stage (the "jellyfish stage"). This way of reproduction is known as "alternation of generations". This alternation of generations may facilitate the transport of jellyfish by shipping through ballast water (planktonic planula, ephyrae or medusa) or fouling (benthic scyphistoma or strobila). The scyphozoan reproductive cycle is typically dominated by the medusoid stage. Sexes are separate in the medusae and these produce haploid gametes that combine through external fertilization to form free-swimming planula larvae. 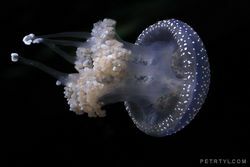 The adult planktonic medusa is commonly referred to as a jellyfish. The planktonic planula larvae of the sexually reproducing medusa search out suitable settlement sites and leave the water column to normally settle to the bottom where it attaches and grows (which is the scyphistoma stage). It may then either directly form additional scyphistoma through a process of budding, and/or develop into a strobila, a benthic form which asexually produces and releases young medusa known as ephyrae, detach from the ends of the sessile scyphistomae in a process termed strobilation. Ephyrae develop into mature medusae over a period of usually several weeks. One study concluded that small Western medusa and ephyrae grow in the early summer, but when researching in Brazil, they found that in the winter and spring, all sizes of Phyllorhiza punctata are present. The study concluded the cause of this was linked to extended photoperiod and seasonal high water temperatures. ↑ Unknown. Australian White-spotted Jellyfish Houston Zoo Fast Facts. Web. Date-of-access 10/7/2014. ↑ Jaskula,Patrick. Invertebrate Project: The White Spotted Jellyfish "Biology 11 Blog".Web. Date-of-publication 19 December 2012. ↑ Life of Sea. Life of white spotted jellyfish. "Life of Sea".Web. Date of publication Friday, July 08, 2011. ↑ Lendenfeld, Von. Phyllorhiza punctata Guidebook of Introduced Marine Species of Hawaii. Web. Date-of-access 10/7/2014. ↑ Masterson, J. Phyllorhiza punctata Smithsonian Marine Sation at Fort Pierce. Web. Date-of-last-update June 13, 2007. ↑ Masterson, J. Growth Phyllorhza Puncata. Web. Date-of-access 10/12/14. ↑ Graham, W.H. Phyllorhiza punctata. Texas Invasive Species Institute. Web. 10-3-14. ↑ Pagad, Shyama. Phyllorhiza punctata (jellyfish). Global Invasive Species Database. Web. 10-12-14. ↑ Komentar, O. Life of White Spotted Jellyfish. Life of Sea. Web. 10-12-14. ↑ Life of Sea, Life of Sea. Life of Sea. Date of publication Friday, July 08, 2011. ↑ Dickerson, Nathan. Jellyfish-Facts. October 13, 2014. This page was last modified on 17 October 2017, at 13:45.